Chili con carne (in America shortened to chili) is a spicy stew-like dish, the essential ingredients of which are beef, pork, venison, or other mature meat, and chili peppers. Variations, either geographic or by personal preference, include the addition of tomatoes, onions, beans, and other ingredients. (Brown sugar is often a favorite condiment). There are also many versions of vegetarian chili, also known as chili sin carne, made without meat (sometimes with a meat substitute). The name "chili con carne" is a slight corruption of the Spanish chile con carne, "chili with meat". Chili con carne is the official dish of the U.S. state of Texas. Texas chilies are generally beef-based, use dried red chili peppers and are therefore red in color. They contain no beans and little or no vegetables other than the chili peppers. This recipe contains no vegetables except chilies which have been prepared by being boiled, peeled, and chopped. In the early part of the 20th century, those likely to regularly spend time in local detention facilities in the American Southwest were said to rate the accommodations by the quality of the chili they were served. This became a matter of local pride and competition with other communities. This is a modern version, as served in the Texas prison system. This recipe is a chili powder- and tomato juice-based sauce combined with cubed or ground beef. The official state vegetable of New Mexico is the chili pepper and the official state question is "Red or green?" This refers to the decision New Mexican chili devotees must regularly make, and which engenders frequent discussion and argument. The red chili is simply a riper form of the green chili; the former is cooked in its dried form and the latter is used fresh from the field, with significant differences in results. For those who simply cannot decide, the standard reply is "Christmas", meaning a portion of each. New Mexico chilies are more commonly based on pork, and include more vegetables than Texas style chilies. Chile verde ("green chili") is generally considered more typical of New Mexican cuisine, possibly because of its more marked visual contrast to Texas-style chili. While there apparently is no canonical recipe for chili verde, all versions involve roasting fresh green chilies and cooking them slowly with meat, garlic, oregano, and cumin. This recipe is a New Mexican dish that is known as the beef stew of New Mexico. It is usually served with tortillas or sopapillas. Chili Colorado ("red chili") is a pork-based chili from New Mexico that uses dried red chili peppers. Another venison based chili con carne. Intended for slow cooking so can use very tough meat. Cincinnati-style chili is a very popular regional variation that is quite different from Texas-style chili. Most notably, it is usually eaten as a topping for spaghetti or hot dogs, rather than as a stew by itself. Cincinnati-style chili is beanless, but a "four-way" serving includes beans on top of the spaghetti under the chili. The connection between cheddar cheese and chili probably originated in Cincinnati, since the cheese normally tops Cincinnati spaghetti dishes. Instead of a tomato-based sauce and red meat (beef), great northern beans and chicken breast meat can be substituted. The resulting dish appears white when cooked, and has more of an alkali bean taste, instead of the acidic taste of traditional chili. Vegetarian chilis acquired wide popularity in the U.S. during the 1960s and 1970s with the rise of the vegetarian philosophy, and is also popular with those on diets which restrict red meat. To make a chili vegetarian, the meat is left out of the recipe or replaced with a meat analogue such as textured vegetable protein or tofu. Some people consider vegetarian chili to be a spicy vegetable stew, and not true chili. This is a kind of chili that needs no meat (and uses no ersatz meat). Molasses gives this chili a somewhat Louisiana flavor. This chili recipe, which is also vegan, uses kidney beans, red and green bell peppers, and chili powder. This vegetarian chili uses black beans. A pot of chili with beans. Several beverages are commonly used to accompany a bowl of chili, including ice-cold beer or cold milk to moderate the impact of the chilies on the throat. Saltine crackers, broken up and scattered on top, are common in chili parlors. Similarly, commercial corn chips can be added as a topping, producing something akin to Frito Pie. Jalapeño cornbread, rolled-up corn tortillas, and pork tamales also are popular for dunking. Peanut butter sandwiches or peanut butter on saltine crackers served on the side can also accompany chili. In Missouri, a small portion of pickle juice is often poured into the bowl of chili. In Indiana, some heap coleslaw in their bowl of chili before eating. Pinto beans (frijoles), a staple of Tex-Mex cooking, have long been associated with chili and the question of whether beans "belong" in chili has been a matter of contention among chili cooks for an equally long time. It is likely that in many poorer areas of San Antonio and other places associated with the origins of chili, beans were used rather than meat, or in addition to meat, due to poverty. In that regard, it has been suggested by some chili aficionados that there were probably two chili type made in the world, depending on what could be afforded and how frugal the cook was. As chili spread east into areas where beef was more expensive (beef was plentiful and cheap in San Antonio and other cattle towns), chili with pinto or other beans became more prevalent. In some eastern areas, this dish is referred to as "chili beans" while the term "chili" is reserved for the all-meat dish. Other changes included the adding of other vegetables. Tomatoes are almost always used, bell peppers are common, and even celery appears in recipes. Many easterners are just as adamant about the inclusion of beans in their chili for an authentic flavor as Texans are about their exclusion. Most commercially prepared canned chili includes beans. Commercial chili prepared without beans is usually called "chili no beans". If you substitute chunks of fresh mushrooms for the beans, you will cut the calorie content of your favorite chili recipe by at least a third, without sacrificing taste. The bland white button mushroom will soak up the flavors of the chilies, tomatoes, chili powder, etc, while helping the chili retain its consistency. Many chili experts believe, however, that beans and chili should always be cooked separately and served on the side. It is then up to the consumer to stir his preferred quantity of beans into his own bowl. Some cooks prefer black beans, black-eyed peas, or kidney beans instead of pinto beans. A popular saying among chili purists is "If you know beans about chili, you know chili ain't got no beans". In Southeast Texas people eat chili over white rice, much like one would eat gumbo; this is due to the proximity to Louisiana. This is also common in the United Kingdom. 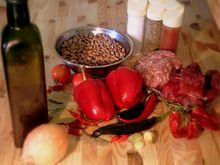 Dishes often described as similar to chili con carne include French cassoulet, Indian curry, Jewish cholent, Serbian bean soups and especially Hungarian goulash. This module uses content from the Wikipedia article "Chile con carne", and is used under the terms of the GNU Free Documentation License. Charles Ramsdell. San Antonio: An Historical and Pictorial Guide. Austin: University of Texas Press, 1959. Joe E. Cooper. With or Without Beans. Dallas: W. S. Henson, 1967. H. Allen Smith. "Nobody Knows More About Chili Than I Do." Reprinted at the International Chili Society web site. Jack Arnold. The Chili Lover's Handbook. Privately published, 1977. This page was last edited on 31 December 2017, at 01:05.